Why Royal College of Music? 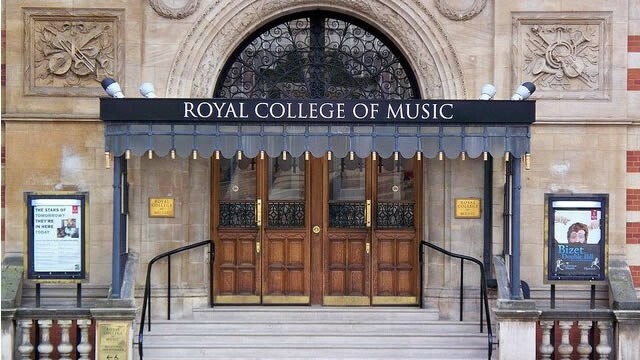 The Royal College of Music (RCM) provides specialist musical education in the centre of London. The college's iconic Blomfield building is situated opposite the world-famous Royal Albert Hall. Facilities include internationally-renowned performances spaces, such as the Britten Theatre and the Amaryllis Fleming Concert Hall. The latter has won huge acclaim for its acoustics following a £5 million refurbishment. There are also practice rooms, teaching rooms, a library, museum and studios which provide vital support for top-level study. Students receive one-to-one lessons and group master-classes with dedicated and experienced professors, many of whom are big names with successful performing careers. As only 650 musicians study at the college at any one time, it is the perfect size to offer a vibrant musical community, yet still have the personal touch. The RCM also enjoys partnerships with London’s leading orchestras, opera houses and concert halls. This enables RCM students to perform on a professional stage, alongside well-known figures in the music industry. More than 50 % of RCM students come from outside the UK, representing 62 countries across the world. The college's teaching staff are also drawn from every corner of the globe. The RCM's friendly atmosphere provides a unique opportunity in which to build contacts and friendships with musicians from across the world. Support staff provide advice to international students on a range of subjects, from accommodation to finances. The college will help you to become a working musician. The world-leading Woodhouse Professional Development Centre will help you to market yourself, manage your finances and build up teaching practice. "We have no excuse not to feel inspired at the Royal College of Music. It is not only one of the best music conservatoires in the world, but it also has a great atmosphere for learning and an excellent piano faculty in which we can develop our talent to the full." 650 students and 320 staff. The RCM has the largest research community of any UK conservatoire. Notable alumni include composers Benjamin Britten, Gustav Holst and Sir Andrew Lloyd Webber. The library contains more than 9,000 CDs and 400,000 items of printed music, from contemporary scores to early 16-century printed music.